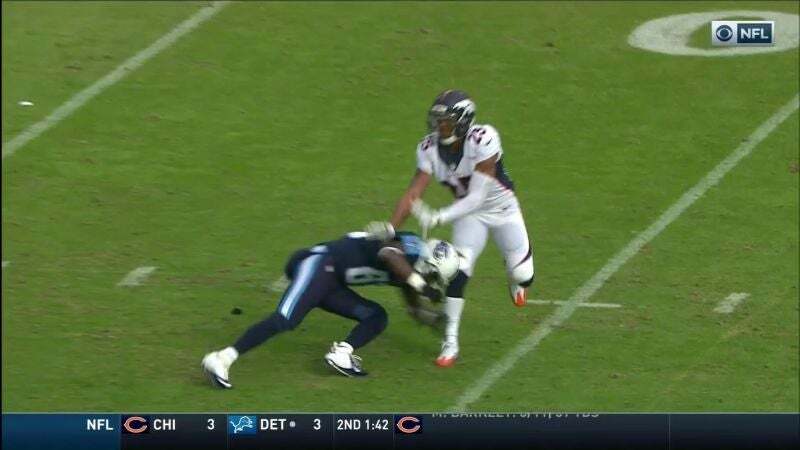 Aqib Talib and the rest of the Broncos defense were furious with Titans receiver Harry Douglas after Douglas threw a cut-block right into Chris Harris Jr.’s right knee yesterday. Talib brawled with Douglas on the very next play, but that apparently wasn’t enough to satisfy his desire for revenge. Despite the anger and threats coming from the Broncos, Douglas maintained that his block on Harris Jr. was perfectly legal. To Douglas’s credit, the block was technically legal: Harris Jr. wasn’t engaged with another blocker and was looking right at Douglas when the block came. That’s the kind of standard issue cut-block linemen and linebackers have to deal with all the time, but not something that cornerbacks normally out in space do. This is football, though, and technical legality doesn’t necessarily absolve a play from being dirty or dangerous.